Originating in Strasbourg, France, Yeallow’s adventure began in 2010, when four friends were united in their common but vital need to make music. Those four friends are Fred aka PMGM (Vocals, Guitar & Keyboards), Ted (Guitar & Backing Vocals), Bill (Bass) & Ced (Drums). Yeallow’s musical identity stems from an eclectic mix of music influences from jazz and blues to alternative rock and thrash metal. The band wasted no time in crafting their modern rock sound with catchy riffs, a distinct tone of voice, uncompromising drums and bass and what they term ‘a guitar drenched in testosterone’. It is this sound that has earned Yeallow their dedicated fan base. This is no doubt thanks to their relentless touring on an international scale with shows that have been described as a mix of ‘rare energy and explosive cocktail’. 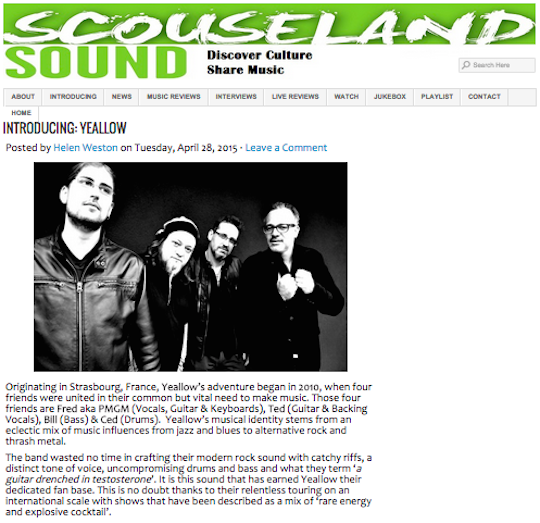 Upon forming in 2010, Yeallow soon found themselves on a U.S. tour following the release of debut album, 2891 Seconds. It was on this tour they took in legendary clubs including Los Angeles’ Whiskey-A-Go-Go and San Francisco’s Cat Club. On their home turf in France they played the countries major regional theaters including La Laiterie, Noumatrouff and the Bus Palladium Paris. Now Yeallow have just last week released their anticipated album Homebred, featuring upcoming single The Trick (Due for release May 1). Take a look at our review of single The Trick (Out May 1), for a taste of what to expect from debut album Homebred (Out Now via Dowload & physical CD).